Ferrari say Fernando Alonso has undergone a training regime "worthy of an Olympic athlete" ahead of the second pre-season testing session. The Spaniard opted to miss the first week of testing in Jerez to concentrate on his physical fitness. In Alonso's absence, team-mate Felipe Massa drove Ferrari's new F138 in the fastest time of the week. 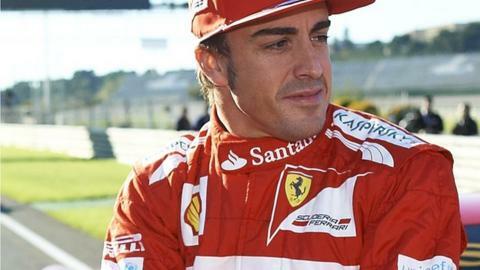 Alonso's training was "a focused physical preparation worthy of the best Olympic athlete", said Ferrari. "Fernando has maximised the time available and tackled the task with great dedication," the Italian team added on their official website. Massa's best time of one minute 17.879 seconds was recorded on the last of the Brazilian's three days of testing in Jerez, with Ferrari development driver Pedro De la Rosa taking over for the other day. Pre-season testing now moves to Barcelona's Circuit de Catalunya from 19-22 February, with Alonso to drive the new Ferrari for the first three days before handing over to Massa. The Circuit de Catalunya is considered a far greater test of a car's overall capabilities than Jerez, and for the final testing session, from 28 February to 3 March, Alonso and Massa will drive on alternate days. Alonso, who has finished second in the championship in two of his three years at Ferrari, has revealed the extent of his training regime on his Twitter account. "Summary of the last three weeks of preparation - 936km bike, 91km run, 8hrs swim, 7hrs gym, 14hrs various (ski, tennis, soccer, etc)."